MTA presents its new development regarding the software tools for its electronic products: MTA Studio®, MTA Speedy Creator®, MTA Core® and MTA Gate®. MTA Core is the result of an important development project carried on by MTA electronic department engineers that led to the creation of a standardized software platform now used as a starting point by the company for all control devices, as well as for displays and dashboards. MTA Core is an embedded software library containing general-purpose logics and functions and an engine that manages all the typical states of an automotive application, offering the company the possibility to quickly and robustly create whatever the customer requests starting from a proven platform, to be subsequently adapted and configured according to the various applications’ specific needs. 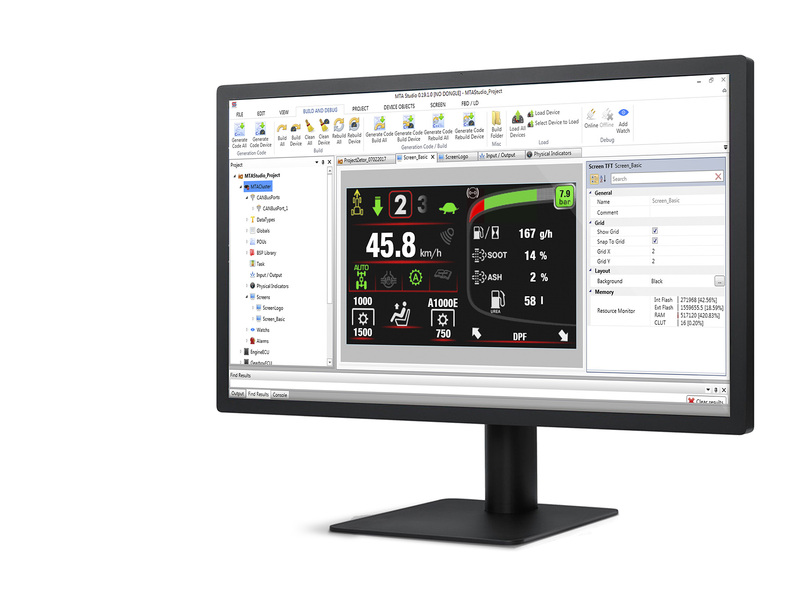 User configuration of MTA Core is possible thanks to MTA Studio, the software tool developed by the company for the Windows environment that allows the simple customization of dashboards, displays and units even by those who are less expert. MTA Core represents a new way of working that generates positive effects on the timing and quality of software development, effects that have already benefited recent off-the-shelf products of the MTA Studio range. MTA electronics division has also adopted the Android Studio development environment, an open source platform used for displays and panels with very complex graphics. In this case a plug-in was created called MTA Speedy Creator, an integrated working environment that facilitates and optimizes the development of advanced interfaces and logics. The configurability of devices developed with both MTA Studio and Android Studio has greatly improved thanks to the introduction of the new MTA Gate PC tool, a simple interface for designers, but also for dealers and maintenance technicians for the vehicles our electronic devices are mounted on. This allows software updates and the quick and safe configuration of certain vehicle parameters like, for example, language and wheel diameter. Press Release – Software tools.